A 22-year-old site manager in Milton Keynes is celebrating after landing a prestigious award for hitting the highest standards in housebuilding. Rising home-building star Jack Allen was recognised for his excellence in on-site management at Bovis Homes' Whitehouse Park location. Despite only working in the role for 12 months, he was one of those selected out of more than 16,000 site managers across the country to win a National House Building Council (NHBC) Quality award. He picked up the gong in the Southern region of the Pride in the Job Awards 2018. The achievement highlights Bovis Homes drive to build quality new homes and deliver for its customers in its Northern Home Counties region. Jack said: “I'm really happy – in fact everyone on the team is pleased. We've got a good group here and it's the care that our people and contractors take on the site that makes the difference, with everyone working towards the same goal. “You can see it in customers' faces. It's my first year as site manager and what I've always wanted." Michael Stirrop, managing director of Bovis Homes' Northern Home Counties region, said the company had had “fantastic feedback” from customers as a result of the team's efforts. He said: “This is a tremendous achievement for Jack and the whole Milton Keynes team. Our hardworking staff are excelling in their day-to-day jobs and we are getting fantastic feedback from house buyers. Jack will now be entered for the Seal of Excellence and Regional Winner titles, the winners of which will be announced on 26th October. 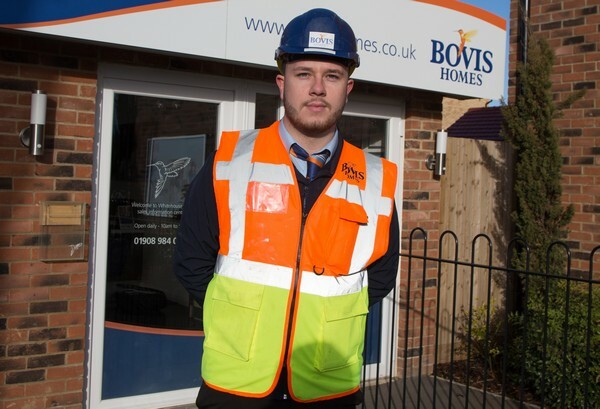 Jack is one of six Bovis Homes site managers who won Pride in the Job awards across England this year. It is the highest number since 2012.